The investment of R55-million in a new truck plant for Hino trucks on Toyota SA’s extensive manufacturing site in Prospecton, near Durban, is confirmation of the importance of these large commercial vehicles to the country’s leading motor manufacturer. This was the message from president and CEO Dr Johan van Zyl when he addressed a large group of dealers, customers and media representatives at the new plant on Wednesday (May 21). The official opening of the relocated assembly plant was attended by a number of dignitaries, including the chairman of the board of Hino Motors Limited, Masakazu Ichikawa. Dr van Zyl went on to say that this latest investment in the truck plant is only part of recent investment in local production, with more than R1-billion having been spent on production facilities in Prospecton over the past couple of years. He went on to add that Hino is a strong brand with great global success and in South Africa the truck segment of the market is seen as a good growth opportunity, both in the domestic and export markets. The new assembly plant currently has an annual production capacity of 5 000 units on a single shift and this can be increased significantly as demand grows. The number of people employed at this plant and its related support functions currently stands at over 160 team members. The move to the new facility took place during shutdown at the end of last year and enabled us to implement a new assembly principle called the Jundate Principle. This allows for sub components to be assembled away from the main assembly line. Once these parts are assembled they are delivered in sequence to the line JIT (just in time) to be fitted to the unit on line with benefits in terms of both productivity and quality. At present the trucks produced here – all the Hino models as well as Toyota Dyna – are for the domestic market and neighbouring countries only. 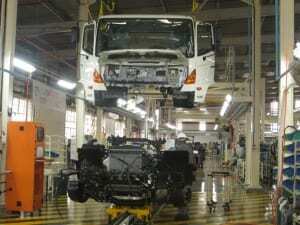 Hino trucks for other markets in Africa are imported from Japan, with many passing through South Africa to have bodies and special equipment fitted. A switch to local production for some of these export markets could occur in the future. The TSAM president and CEO went on to that that besides the company’s investment in the Hino brand he is particularly upbeat in terms of the confidence being shown in the brand by the Hino dealers recently. “Significant investments have been made and are currently being made by them in new and upgraded premises. Almost 50% of our Hino dealer network has invested or is currently investing in new or revamped premises since 2010, with the total investment over the period running to well over a R100-million. “These investments by our dealers – many of whom have been involved with Hino trucks since they arrived in South Africa in 1972 – correspond with our Hino Total Support philosophy. With our dealers, we aim to provide excellent, high quality customer experience in both the sales and parts delivery areas of the business – it truly is the only way to Keep on Trucking,” said Dr. Van Zyl. Globally Hino recently reported new records in terms of unit sales, sales revenue and profit for the 2013/14 financial year, which ended on March 31. Unit sales increased by 7.5% to 162 000 with 68.6% of sales coming from markets outside Japan and the company remained the leader in the Japanese domestic truck market with a dominant market share of around 30%. South Africa is one of the growth markets for Hino and Hino SA is regularly among the top 10 export destinations. Domestically, Hino has made a good start to the year in the local market with total sales of 1 126 medium, heavy and extra-heavy trucks in the first four months of 2014. This equates to second place in the rankings of local truck manufacturers and distributors and Hino retained its No. 1 position in the medium commercial vehicle segment with Dyna and Hino 300. More than 130 000 Hino and Dyna trucks have been sold in SA to date, giving Hino one of the largest truck parcs in the country. Dr van Zyl went on to say that on the global stage, one of the highlights for the year in the Hino world is the company’s participation in the annual Dakar Rally in a joint venture with Team Sugawara and he was pleased to announce that Hino will be back in 2015 with further improved 500-Series trucks. “Hino is the only Japanese truck maker that competes in this gruelling marathon event and has by far the best reliability record of any participating manufacturer with 23 consecutive finishes since entering for the first time in 1991. This year both trucks again completed the course and finished 1-2 in the category for trucks with engines of less than 10 litres capacity. “Next year the team will not only be looking for a sixth successive win in the under 10-litre category, but will also be aiming for a high position in the overall classification as both racing trucks will use the more powerful 9-litre A09C engine – certainly something to look forward to,” concluded Dr. Van Zyl.